"A single 39-year-old man who cannot get married" and "a divorced 32-year-old woman who doesn't want to get married again". The unlikely couple has enough trouble as it is, but with their nosey parents, their problems grow even bigger. This funny yet touching home drama asks viewers what family and marriage are. "In the current style of life in which people increasingly choose not to get married, this drama will make viewers think about the role of family and marriage once again" the producer says. 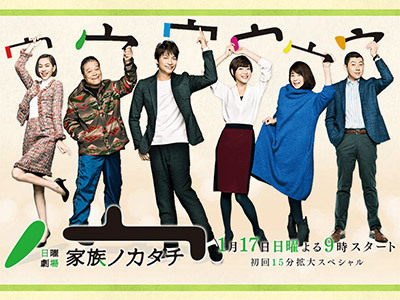 It's a dorama very boring at the beginning, those ones you think it's a waste of time watching them, but I decided to give it a chance, and now I can say I don't regret. When the feelings of the characters start to flow is when it become more interesting, seeing that they weren't so plain as I guess in the first episodes. The plot is easy and simple, the struggle between living alone or not. Two neighbors who have decided the way of the solitude, will have to share their space by surprise with their respective relatives, during that time they have to learn to share and appreciate the values of the family. The cast is not so splendid, but the performance of Juri Ueno is remarkable, it's difficult to believe is the same actress who play the Nodame role in Nodame Cantabile. Superb! It's worth a mention apart seeing the logo of FC Barcelona Soccer team here. Forsa Barsa! Sort of a mash up between "Kekkon Dekinai Otoko" and "Saigo Kara Nibanme" with the old terminal illness cliche thrown in. It might have worked better if either of the lead characters had any redeeming personality traits. Really enjoyed this subtle family work life drama! !